I feel Miaphysite Mina would be a better one. 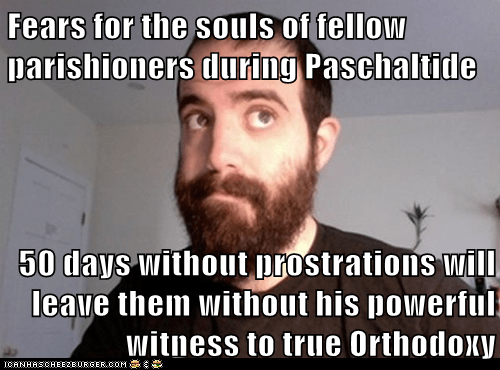 I just had to...Agabus reminded me of a conversation I overheard during last Pascha. 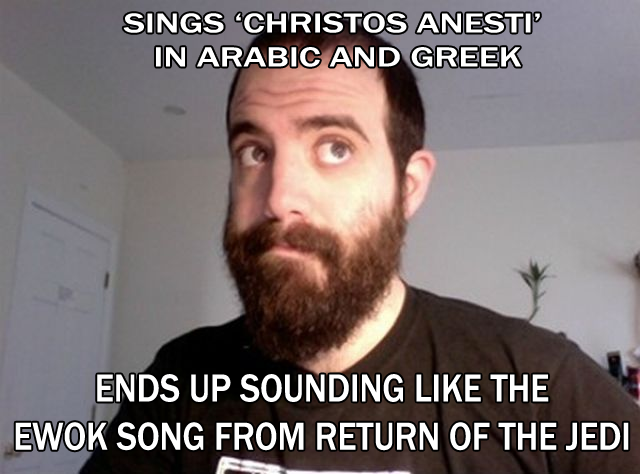 Sings "Christos Anesti" louder than anyone in the church on Pascha. Has no idea what he's actually singing. goes online to trade up for a pectoral cross, citing an old canon that permits both clergy and laity to wear them. Am I the only one that reads the hyperdox Herman scenarios and hits their head on their monitor? This thread should see a significant increase in Cradle Christopher contributions, seeing as many just made their presence known for the first and only time last night. This thread should see a significant increase in Cradle Christopher contributions, seeing as many just made their presence known for the first and only time last night night. spends whole liturgy looking at icons anew since he doesn't remember any of them from last pascha (he usually blacks out drunk afterwards). Being a bit serious here, but am I the only one who notices that many of the 'Cradle Christophers' seem to be harder on the converts, thus possibly contributing to why many of them become 'Hyperdox Hermans'? Like, for example, I'm a convert and I know a couple of converts, and it seems like most of the cradle Orthodox seem to be really hard on us at times, and the ironic thing is that they do not even do half of the stuff they scold us for doing improperly/not doing! I'm not offended by this at all, but I do find it strange. Is it just sort of like an 'initiation ritual' joke, little t tradition that the more experienced Orthodox to do test our dedication or make sure we're committed or something? they feel justified by correcting others...i think its just psychology. No offense, James, but Michal Kalina already made the Cradle Christopher cigarette joke fairly early in this thread- except he had it as early as the homily going long! I think both memes are coming to an end- we're starting to repeat ourselves here. hey now, just because we repeated one or two doesn't mean we don't have any fresh material I for one think we have at least a few weeks left here! Does it make me hyperdox that I don't approve of the giant screen that had been erected outside one of our churches which, in addition to showing "highlights" of the action during the resurrection service, also displayed various powerpoint-like tidbits such as "Pascha 2012: brought to you by St Spyridon's parish"? meh, as long as it's outside the parish, whatever. Now, if they start projecting on the back of the priest's newly white robe, we got problems. "Enter all of you, therefore, into the joy of our Lord, and, whether Herman or Christopher, receive your reward." Fast approaching sig-line material, that is. Can we do a female version of Cradle Christopher? Oh, come on, guys -- this material is gold. Makes me thing of some of the mail-order brides we have around town from Ukraine and Russia. A couple of them are always/sometimes in Church. The rest aren't as serious. I hate to judge, but you can see their underwear through their spandex pants. It's crazy. Would they dress like that back in ___? I don't have any (not all teenagers are horny perverts!). It's just crazy to see them do full bows in front of the Church and seeing their unmentionables. Craziness. I've never personally experienced this. -Can correctly pronounce it only in English. It's sort of like the bully at recess. Since I like to think I've gotten past hyperdoxy, I recognize the same things in others, and take pleasure in pointing it out (not to their faces). I only converted 3 years ago, I can't imagine how this must be for cradles. I'm not a teenager, but I am a horny pervert. **I would like to mention that during Serb-fest in the summer, my friends and I pay for 25% of the Church's yearly operating cost. I think you are right - for whatever reason, and it may stem from our 'ethnic ghetto' mentality and our preoccupation with property rights in American Orthodoxy, for many cradles are often overly hard on converts. I know my dad would be exasperated with otherwise good parishioners who would be - for lack of a better word- outright mean to inquirers or even folks who moved into town who were already Orthodox. I do think, at least from my home parish, that we have gotten better about this as time as passed. This weekend our pastor christmated and/or baptised eight people, six of whom were simply from the neighborhood and over the years had started coming to liturgy. They were welcomed and years ago would have been shunned. So take heart and hang in there! Stereotypes are helpful learning tools but they can also be an excuse to prevent true growth. Christ is Risen! March 9- one of the few non-weekend wine and oil days during Lent. Probably going to get flamed like heck for this, but I like the idea of a female Cradle Christopher; let's call her Cradle Christina. ...All this tight spandex should cover me! Pffh, no headcovering?! That woman over there has no class! What a tramp, that girl's bra strap is showing!